Our Food Engineering Tests allow you to experience an online examination in the real-time environment. In every online test on Food Engineering, you will be presented with Multiple Choice Questions (MCQs) which will test your skills in Food Engineering Concepts in a detailed and comprehensive manner. In the test, each question will have 4 options to choose from. You should select only 1 correct option as an answer and then move on to the next question. Once you submit answers to all the questions, you will be given your final test score. In the Online Food Engineering Test, for every correct answer, you will be given 2 points. There will also be negative marking of -1 for every wrong answer. So, you will have to be more careful in choosing the answers to the question in your online examination. If needed, you should skip to the next question and come back to the previous question later so that you can do proper time management for the online mock tests. 1. "Food Engineering Practice Tests" - In Food Engineering practice tests, there will be a series of practice tests wherein you can test your Food Engineering concepts on every chapter separately. There will not be any time limit on these tests. So, Food Engineering Practice Tests should be the first set of tests which you should attempt. Goto these practice tests here. 2. "Food Engineering Mock Tests" - In Food Engineering mock tests, there will be a series of mock tests wherein you can test your Food Engineering concepts on every chapter separately, but there will be a fixed time limit per test. So, it is similar to Food Engineering Practice Tests, but with an added constraint of time limits. 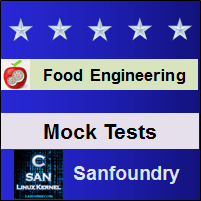 You should try Food Engineering Mock Tests if you are appearing for any online examination soon. Goto these mock tests here. 3. 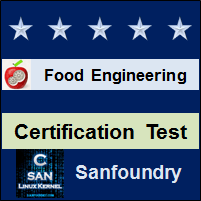 "Food Engineering Certification Test" - Once you are through with your Food Engineering concepts, then you should try our Food Engineering Certification Test wherein Sanfoundry will issue a free Certificate to you if you scored either Grade A* or Grade A in Food Engineering Certification Test. Goto Food Engineering Certification test here. 4. "Food Engineering Internship Test" - If you are interested to do Internships in Food Engineering at Sanfoundry, then you must take our Food Engineering Internship Test. If you scored either Grade A* or Grade A in Food Engineering Internship Test, then you are eligible for Internship at Sanfoundry in Food Engineering. Goto Food Engineering Internship test here. 5. "Food Engineering Job Test" - If you are a fresher, a dropout, an experienced person and if you know Food Engineering well and looking out for jobs in Food Engineering domain at Sanfoundry (or our Network of Companies), then you should try and qualify our "Food Engineering Job Test". 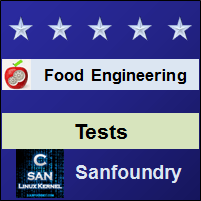 If you scored either Grade A* or Grade A in Food Engineering Job Test, then you are eligible for a Job at Sanfoundry (or our Network) in Food Engineering domain. Goto Food Engineering Job test here. For every "Food Engineering Practice Test", Total Questions: 20, Total Time: Unlimited. For every "Food Engineering Mock Test", Total Questions: 20, Total Time: 20 Minutes. For "Food Engineering Certification Test", Total Questions: 50, Total Time: 1 hour. For "Food Engineering Internship Test", Total Questions: 50, Total Time: 1 hour. For "Food Engineering Job Test", Total Questions: 50, Total Time: 1 hour. Before you get started on these series of online tests on Food Engineering, you should learn, study and practice our collection of 1000 MCQs (Multiple Choice Questions and Answers) on Food Engineering here. We also prefer that you should practice Food Engineering practice tests and mock tests completely before attempting the certification test. Here is the list of online practice tests and mock tests on Food Engineering. Each online test focuses on a "Specific chapter of Food Engineering". So, you should try both practice test and mock test on every chapter to do a self-assessment of your knowledge (along with time-limit constraints) in every area or sub-topic of Food Engineering. Food Engineering Certification test, Internship test, and Job Test are mentioned at the end of this list. 1. Food Engineering Test 1 – This set of online test on “Food Engineering” tests your skills on Characteristics and Composition of Food, Water, Carbohydrates and Dietary Fibre – 1, Water, Carbohydrates and Dietary Fibre – 2, Fats, Trans-fats, Proteins, Amino acids, Vitamins, Minerals – 1, Fats, Trans-fats, Proteins, Amino acids, Vitamins, Minerals – 2, Effect of Food Processing on Nutrition and Food Safety, Food Contamination and Hazards, Food Adulteration, Food Additives. 2. Food Engineering Test 2 – This set of online test on “Food Engineering” tests your skills on Food Packaging and Labelling, Regulations and Labeling Requirement, Food Processing, Fruits, Vegetables and Milk Processing, Meat Processing, Oil Processing, Grain Milling, Tea and Coffee Processing. 3. Food Engineering Test 3 – This set of online test on “Food Engineering” tests your skills on Spices and Condiments, Food Processing Techniques – 1, Food Processing Techniques – 2, Unit Operations – Fluid Mechanics – 1, Unit Operations – Fluid Mechanics – 2, Unit Operations – Rheology of Foods, Unit Operations – Heat Transfer by Conduction, Unit Operations – Heat Transfer by Convection – 1, Unit Operations – Heat Transfer by Convection – 2. 4. Food Engineering Test 4 – This set of online test on “Food Engineering” tests your skills on Unit Operations – Heat Transfer by Radiation, Unit Operations – Heat Transfer Equipment, Unit Operations – Microwave Heating, Unit Operations – Evaporation – 1, Unit Operations – Evaporation – 2, Unit Operations – Diffusion and Mass Transfer – 1, Unit Operations – Diffusion and Mass Transfer – 2, Unit Operations – Dehydration – 1. 5. Food Engineering Test 5 – This set of online test on “Food Engineering” tests your skills on Unit Operations – Dehydration – 2, Unit Operations – Equilibrium Stage Operations – 1, Unit Operations – Equilibrium Stage Operations – 2, Unit Operations – Extraction – 1, Unit Operations – Extraction – 2, Unit Operations – Crystallization – 1, Unit Operations – Crystallization – 2, Unit Operations – Filtration. 6. Food Engineering Test 6 – This set of online test on “Food Engineering” tests your skills on Unit Operations – Sedimentation and Centrifuge – 1, Unit Operations – Sedimentation and Centrifuge – 2, Unit Operations – Mixing – 1, Unit Operations – Mixing – 2, Unit Operations – Size Reduction and Seperation – 1, Unit Operations – Size Reduction and Seperation – 2, Unit Operations – Material Handling and Transportation, Food Preservation – 1, Food Preservation – 2. 7. Food Engineering Test 7 – This set of online test on “Food Engineering” tests your skills on Principles of Fresh Food Storage-1, Principles of Fresh Food Storage – 2, Principles of Fresh Food Storage – 3, Principles of Refrigerated Gas Storage of Foods – 1, Principles of Refrigerated Gas Storage of Foods – 2, Principles of Food Freezing – 1, Principles of Food Freezing – 2, Principles of Food Freezing – 3. 8. Food Engineering Test 8 – This set of online test on “Food Engineering” tests your skills on Principles of Food Preservation by Canning – 1, Principles of Food Preservation by Canning – 2, Principles of Food Preservation by Canning – 3, Principles of Food Preservation by Canning – 4, Principles of Food Preservation by Canning – 5, Principles of Food Preservation by Canning – 6, Principles of Food Preservation by Drying – 1. 9. Food Engineering Test 9 – This set of online test on “Food Engineering” tests your skills on Principles of Food Preservation by Drying – 2, Principles of Food Concentrates – 1, Principles of Food Concentrates – 2, Principles of Food Concentrates – 3, Principles of Semi – Moist Foods – 1, Principles of Semi – Moist Foods – 2, Principles of Food Preservation by Fermentation – 1, Principles of Food Preservation by Fermentation – 2. 10. Food Engineering Test 10 – This set of online test on “Food Engineering” tests your skills on Principles of Food Pickling and Curing – 1, Principles of Food Pickling and Curing – 2, Principles of Chemical Preservation of Food – 1, Principles of Chemical Preservation of Food – 2, Principles of Food Irradiation – 1, Principles of Food Irradiation – 2, Principles of Food Storage Stability, Food Quality factors and Principles of Quality Assurance and application of technology. 11. Food Engineering Certification Test - This set of online free certification test on "Food Engineering" tests your skills on all areas (all chapters, topics and subtopics) of Food Engineering. 12. 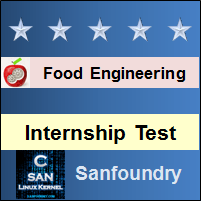 Food Engineering Internship Test - If you scored either Grade A* or Grade A in our Food Engineering Internship Test, then you can apply for Internship at Sanfoundry in Food Engineering. 13. 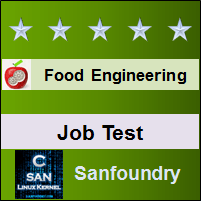 Food Engineering Job Test - If you scored either Grade A* or Grade A in our Food Engineering Job Test, then you can apply for Jobs at Sanfoundry in Food Engineering domain. Best Wishes for your Food Engineering Tests!